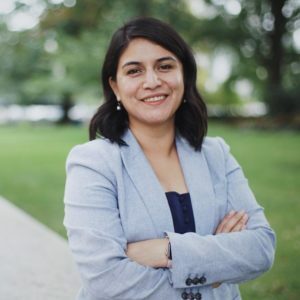 Alaide Vilchis Ibarra is the executive director of the Interfaith Movement for Immigrant Justice (IMIrJ), an organization that equips communities and people of faith throughout Oregon to advocate, accompany and organize around immigrant justice. Previously, Alaide was the program director for migration policy at the Evangelical Lutheran Church in America, one of the largest protestant denominations in the United States, where she led the advocacy portfolio for the church’s regional migration strategy for Central America, Mexico, and the United States. Alaide is a DREAMer who became a United States citizen in 2014. She found her voice as an advocate testifying in the Kansas legislature to protect access to higher education for immigrants like her. She loves hiking, hanging out with dogs, and learning new skills.